He was born Rodrigo (or Ruy) Díaz de Vivar. Vivar being the town where he was born. It is near Burgos. He was born either in 1040 or 1043. Historians are not sure of the date. He died in Valencia in 1099. His name, "El Cid" was given to him by the Moors. In the mixture of the Spanish and Arabic language they used, they called him "As-Sid" (Lord or Chief). This was pronounced by the Spaniards as "El Cid", but they themselves actually called him "Campeador" (Champion). Fernand had hoped that his children would be happy with their lands. Sancho being the eldest thought that he should have inherited all of his father's lands. Sancho first needed to do battle with the Kingdom of Aragon which was not under control of any of his family. El Cid proved to be such a help in defeating the Kingdom of Aragon that he was named Commander of the Royal Armies. At this time he was only about 23 years old. About 1070 Sancho began his war against his brothers and sisters. He first waged war against his brothers in Leon and Galicia. Both victories were accomplished with the great assistance of El Cid who turned almost certain defeats into victories. Sancho exiled his brothers to the city of Toledo. Sancho then took the city of Toro which was the domain of his sister, Elvira. He then began a battle with his sister Urraca and her city of Zamora in 1072. 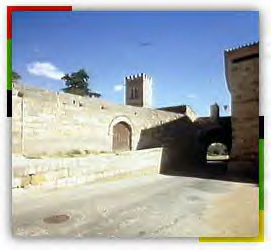 However Sancho was killed by one of Urraca's soldiers right at the city gates. Upon hearing of his brother's death, Alfonso rushed to Zamora to claim his brother's lands and most importantly the throne. He became Alfonso VI. 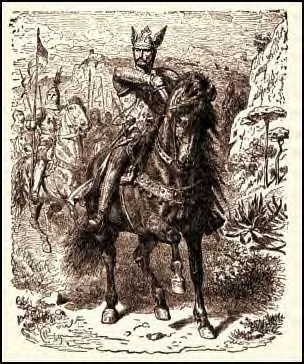 El Cid became concerned for his life. He had after all helped Sancho wage war against Alfonso who was now the King. But El Cid had a couple of things in his favor. One he was a very good soldier. Alfonso knew that he would need a leader like El Cid. Also the people in Castile were not happy that they were being led by a king from Leon. El Cid was from Castile and was liked by the people. Alfonso did not really like El Cid. He was afraid that El Cid might attempt to take the throne. Alfonso sent El Cid to the king of Seville to collect money. When El Cid returned he accused El Cid of keeping some of the money. He banished El Cid from his kingdom and from then on El Cid was not able to live safely in any area ruled by Alfonso. El Cid now needed not only money, but also protection of a king. He offered his services to the Ruler of Saragossa in northeastern Spain. The Ruler of Saragossa was the arabic leader, al-Mu'tamin. Unlike Alfonso, al-Mu'tamin was quite happy to have such as successful soldier as El Cid. El Cid served al-Mu'tamin and his successor, al-Musta'in for nearly 10 years. In 1082 he defeated the Moorish (arabic) king of Lérida and the king's ally, the Count of Barcelona. In 1084 he defeated a large army lead by King Sancho Ramírez of Aragon. In 1086 Alfonso VI came under attack from the Almoravid armies from North Africa. He suffered a great defeat at Sagrajas on October 23rd. Realizing that he needed El Cid's help to save his Kingdom, Alfonso recalled El Cid from exile. El Cid returned to Alfonso, but now he had his own plans. He only stayed a short while and returned to Saragossa. El Cid was content to let the Almoravid armies and the armies of Alfonso fight without his help. Even when there was a chance that the armies of Almoravid might defeat Alfonso and take over all of Alfonso's lands. The reason El Cid did not want to fight was because he was hoping that both armies would become weak. That would make it easier for him to carry out his own plan which was to become ruler of the Kingdom of Valencia. The first thing El Cid needed to do was to remove the influence of the Count of Barcelona. Barcelona was the major city in the area and the Count was a powerful man. He defeated the Count (Berenguer Ramón II) at the battle of Tébar in May 1090. Valencia, however was stilled ruled by an Arabic leader, al-Qadir. El Cid became lucky when in October 1092 al-Qadir was killed by one of his noblemen, Ibn Jahhaf. The city of Valencia was thrown into confusion. It was at this time that El Cid decided to attack. He surrounded the city and began a long siege. In May, 1094 Ibn Jahhaf surrendered the city. Although El Cid was a soldier he understood some of the politics of being a ruler. Through his service to Sancho II and then Alfonso VI he learned about Spanish politics. Through his service to al-Mu'tamin and al-Musta'in he learned about Arabic politics. He knew that because Valencia contained a great number of Moors (Arabs) that he would have to have the support of Ibn Jahhaf. He forgave Ibn Jahhaf of all of his crimes including the killing of al-Qadir. 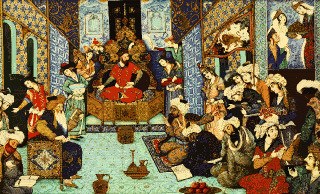 Ibn Jahhaf agreed to use his influence over the Moors so that they would accept El Cid as their ruler. Once this was accomplished, El Cid decided that he did not need Ibn Jahhaf and had him arrested and killed. El Cid technically ruled Valencia for Alfonso. But, Alfonso was not about to wage war against El Cid, so he let him rule with almost no control. El Cid began to act as a king. He appointed a Bishop and he encouraged people to settle in Valencia. He married one daughter, Cristina to a prince of Aragon, Ramiro and his other daughter María to Count of Barcelona, Ramón Berenguer III, whose father he had earlier defeated. El Cid ruled Valencia until his death. After his death the Almoravids attacked the city and Alfonso had to personally go there to save it. However, he decided that he could not defend unless he kept a great number of soldiers there permanently. So he decided to abandon the city and ordered it burned. On May 5, 1102, the Almoravids occupied Valencia and ruled it until 1238. The body of El Cid was returned to Burgos and buried in a monastery. Almost immediately he became regarded as a national hero of Castile. In the 12th century a 3700 line poem "El Cantar de Mío Cid" (The Song of the Cid) was written about him. The poem and later writings such as a play in 1637 made his exploits almost legendary to the point that some people began to doubt that whether El Cid was ever a real person. Unlike King Arthur of English legend, El Cid really did exist. And the poem about him (although it does in some cases stretch the truth), is considered to be the beginning of Spanish literature.